Have you ever watched a horror movie take place in real life? That was the equivalent of what happened to the Buckeyes in front of about 40,000 fans at the Shoe on Saturday against the No. 3 ranked Terrapins. Down 9-5 with under five minutes to play, Maryland stormed back to tie the game in regulation, where they would clinch at least a share of the Big Ten Conference regular season title in overtime. I’ll give you my takeaways from the game, as well as focus on the week ahead as the Scarlet and Gray travel to Piscataway, N.J., to take on Rutgers. #11 Ohio State vs #3 Maryland @ Ohio Stadium. Maryland wins 10-9 in OT. I called Jesse King’s fourth goal of the day for Ohio State student radio, I knew there was a gruesome enemy staring down on the Buckeyes as King’s goal put them ahead 9-5, and that was time. There was still 10:16 left in the game, and I was fully aware of Ohio State’s struggle to put teams away. An almost collapse against Bellarmine, a fourth quarter disaster against Marquette, another struggle to keep Penn State from coming back. I could only sit there in the press box and watch helplessly as this reoccurring theme took a share of the first ever Big Ten regular season crown away from the Bucks. Than a share of that title. There was a pride factor involved here. Think about it. I’m willing to bet that a lot of critics didn’t have OSU five minutes away from a Big Ten title. Just another trophy to add to the cases of Maryland or Johns Hopkins. This wasn’t the case as the Buckeyes fought hard and came up just short. The Scarlet and Gray were also looking to lock down an at-large big to the NCAA Tournament. It’s still not out of the question, as OSU still needs to take down Rutgers this week, as well as have a good showing in the conference tournament. With OSU’s offense. Facing the No. 1 defense in the nation who were giving up just five-and-a-half goals per game, the Buckeyes imposed their will, scoring nine goals. Their best player, Jesse King, was their best player with four goals and two assists. It was tremendous lacrosse by both teams. The battles within the war were fantastic. Tom Carey vs. Kyle Bernlohr between the pipes. OSU’s defense vs Maryland’s. Jesse King vs Jay Carlson, Joe LoCascio and Matt Rambo for the Terps. Christopher May vs John Garino which later turned to Jake Withers vs Andrew Walsh at the faceoff x. I’ll put it right up there as one of the top five games played in all of college lacrosse this season. Having 40,000 watching at the tail end of the game was pretty cool too. The Showdown in the Shoe is an incredible tradition, one that I hope continues for a long time. Should the Buckeyes look past this game. Rutgers had Maryland on the ropes before Matt Rambo’s goal with 13 seconds left gave the Terps a 9-8 win. The Buckeyes still need to come out and take care of business. Hopkins is taking on Maryland in College Park this week. They’ll be more than ready to go for the Big Ten Tournament as OSU/Hopkins is going to be their first round matchup. Has nothing to lose. With a 4-10 overall record and an 0-3 conference record, the Scarlet Knights would love nothing more than their first ever Big Ten Conference win to come over Ohio State. That if Ohio State loses on Saturday, they can kiss their chances at an at-large bid to the NCAA Tournament goodbye. In a sense, a must win game. Junior Scott Bieda and sophomore Christian Trasolini will be a hassle to deal with. Bieda has 28 goals and 24 assists while Trasolini has 25 goals and four assists. Trasolini loves to shoot the ball too. His 104 shots are 35 more than the next closest Scarlet Knight. Won’t be too shabby either. Christopher May heads into this contest with a win percentage of .635. His competition, senior Joe Nardella has a .668 win percentage. Should win this game. They just need to stick to their guns with their two-man game, work off of picks well, toss in a few impressive individual efforts as they always seem to do and their defense needs to have their usual great effort. 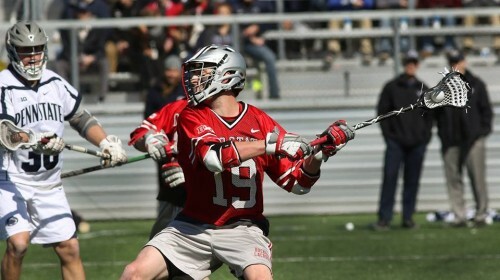 Looking for a bounce back week from the Buckeyes, as well as another stellar week of lacrosse from around the nation. Catch you next Wednesday!